If all you know of fanny packs is the neon pink one your mom wore in the '80s, it's time to re-think your opinion of them! 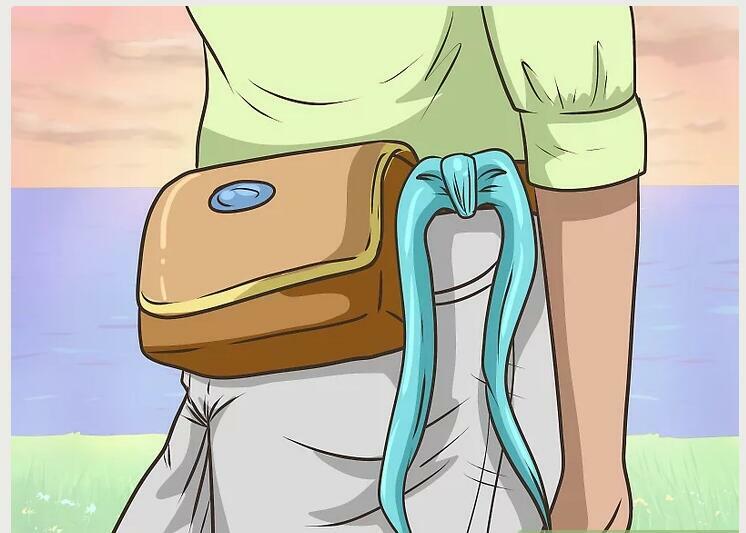 Fanny packs, also known as belt bags, come in all styles and colors now, and you can even find some high-end options. 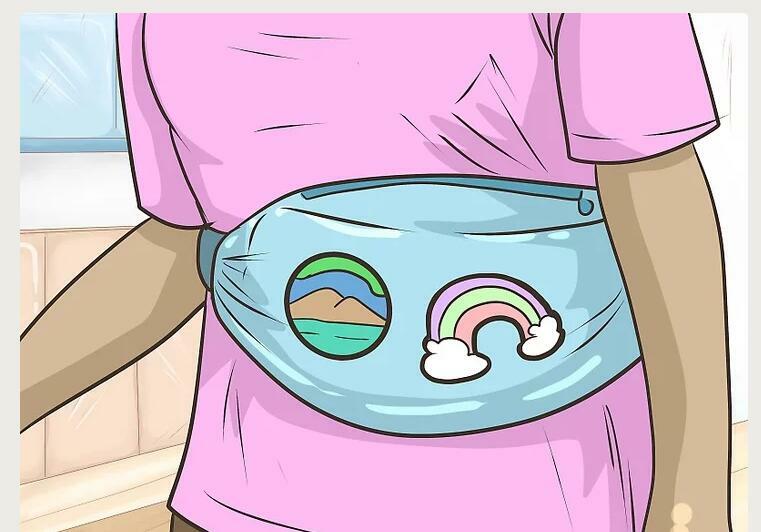 If you want to start wearing a fanny pack, you can arrange the bag on your body in a variety of ways. It's important to take the time to match the bag to your outfit, both with the style you choose and the way you accessorize it. Wear your fanny pack around your waist for a classic style. 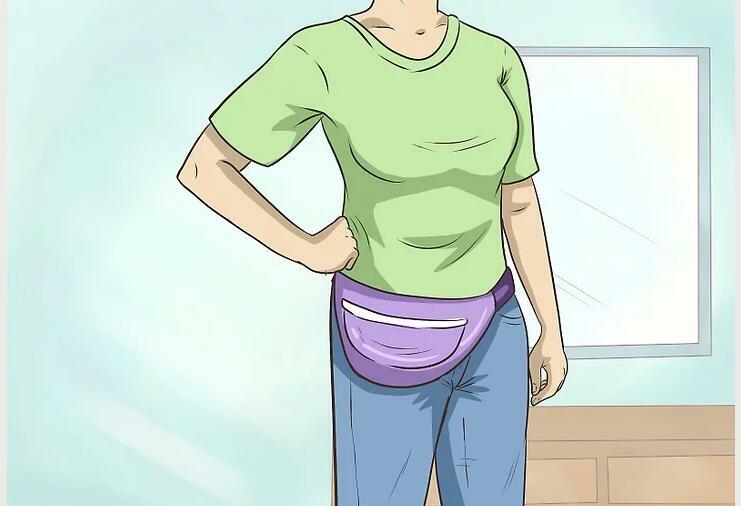 This is the classic way to wear a fanny pack, though you may be surprised to learn you can create different styles just wearing it in slightly different places near your waist! For instance, try wearing it at your natural waist, which is just above your belly button, where your torso is the smallest. 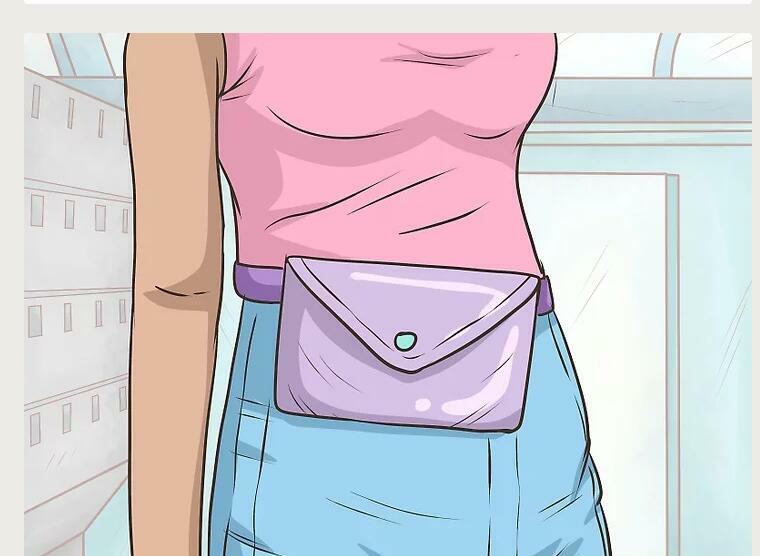 Wearing a fanny pack here helps define the shape of your body. Try wearing it on the front but slightly off-center. You can also place the fanny pack near the top of your pants for a bold approach. 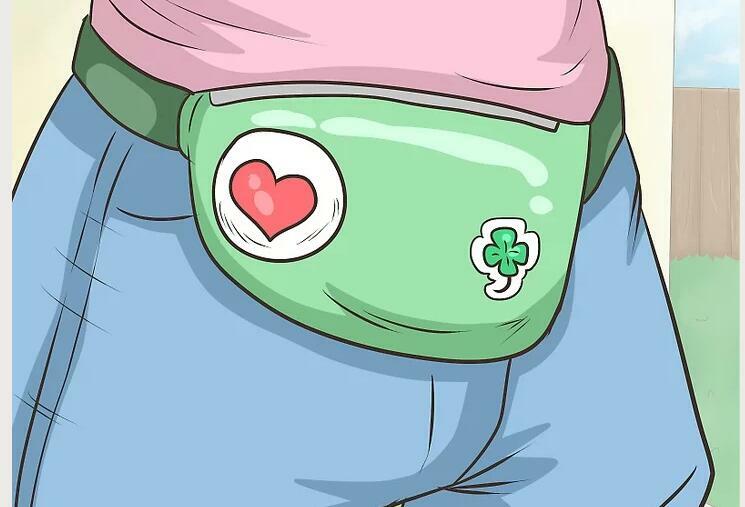 This position makes the fanny pack stand out, since it's sitting near your hips, pushing it outward. 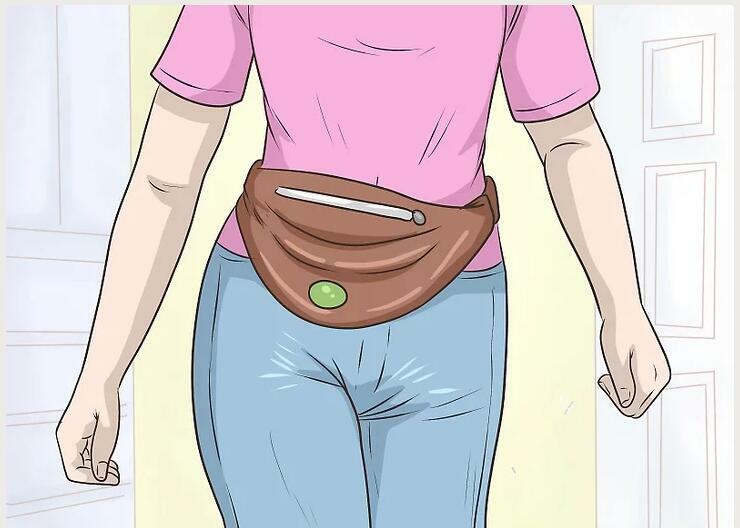 If you want to show off your fanny pack this way, position it at or just below your belly button. You can wear it in the front of your body right in the middle, slightly off-center, or off one hip. Wear a small bag through your belt loops for a subtle approach. Pull the straps through your belt loops from the front with the pack like a belt buckle. Secure it in the back, and then throw a jacket over your whole outfit. 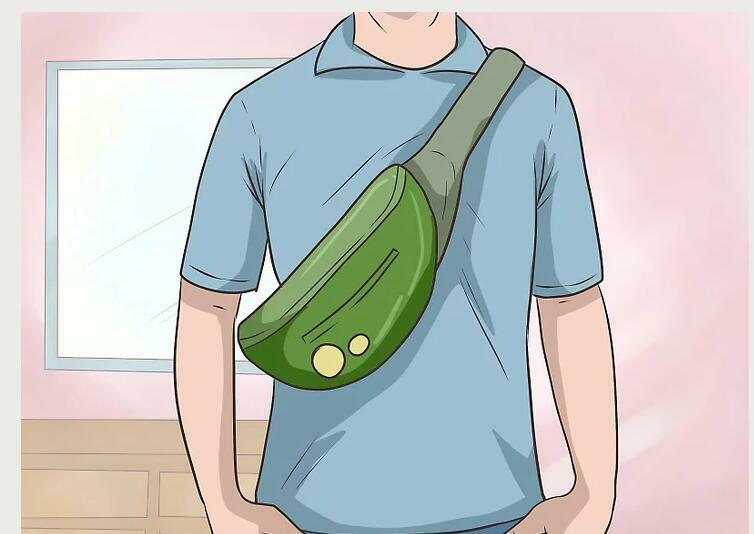 Try wearing your fanny pack turned to the back for a fun surprise. Wear it slung across your backside at your waist. People won't be able to see it in the front, but when you turn around, you'll have a fashionable accessory! Sling the bag across your chest for a more secure approach. 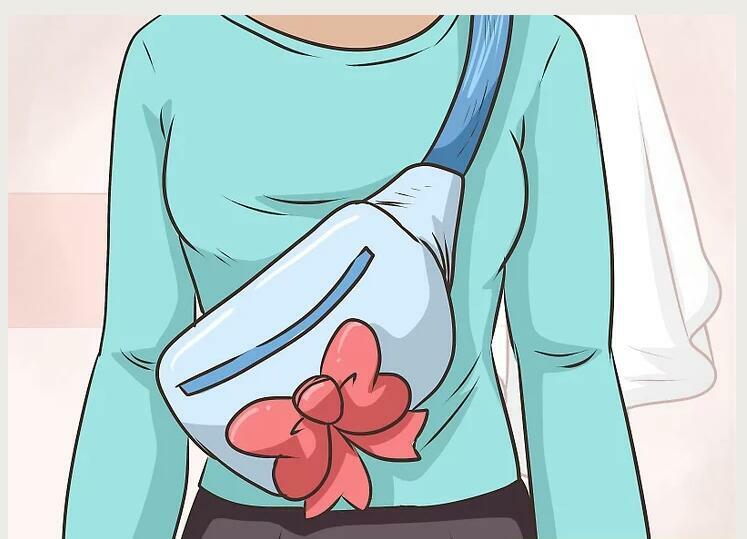 While fanny packs are usually worn around the waist, using one as a shoulder bag can be a trendy look. Wear it across your chest with the bag centered in front. Because it fits close to your body, it will keep all your stuff within easy reach. 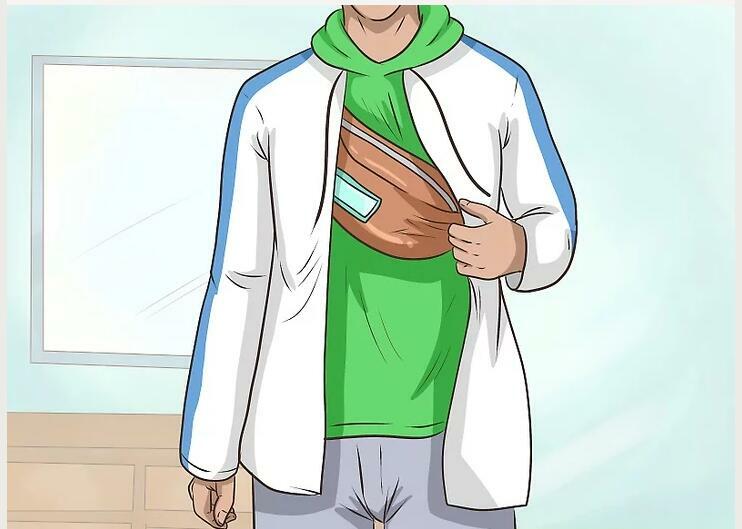 Layer your fanny pack over your clothes to show it off.You can even put a fanny pack on over a jacket. The fanny pack can act as a belt, cinching in your clothes to create a more defined silhouette. 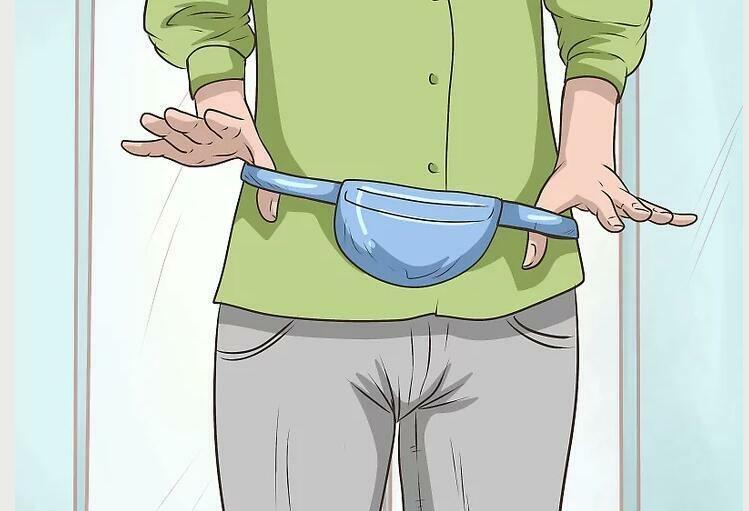 This is the classic way to wear a fanny pack. Wear your fanny pack under a jacket for a chic look. 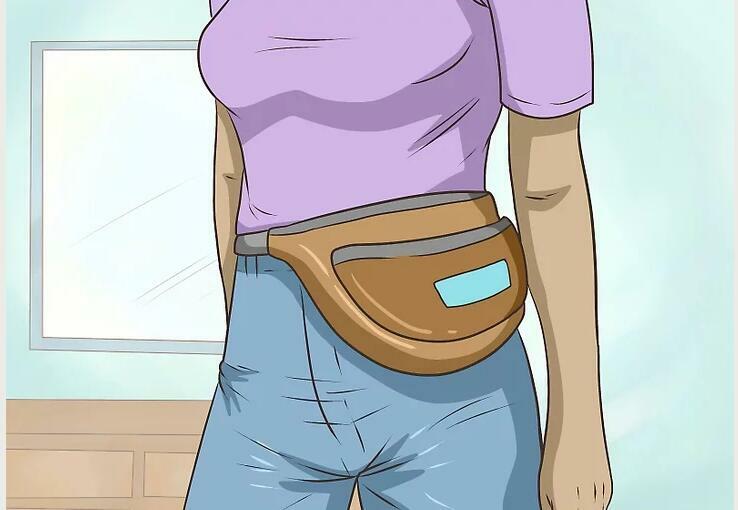 Belt a small leather bag into your pants and wear a shirt you tuck in or that falls just at the fanny pack. Then, throw a jacket over it all to complete the look. This look is great for a rock concert or date night, depending on what jacket you choose! You can also try this look with a statement top and no jacket, such as a plunging silk top with billowy arms that falls just over the top of the fanny pack. Add a fanny pack to a t-shirt and jeans for a casual style. Pair a stylish bag with your favorite shirt and jeans. Sling the bag over your hips, and you're ready for a walk through the park or a fun day at a festival. Try adding flats for a bit of pizazz or simply stick with sneakers if you need to walk a long way. You could also wear corduroys or sporty pants. 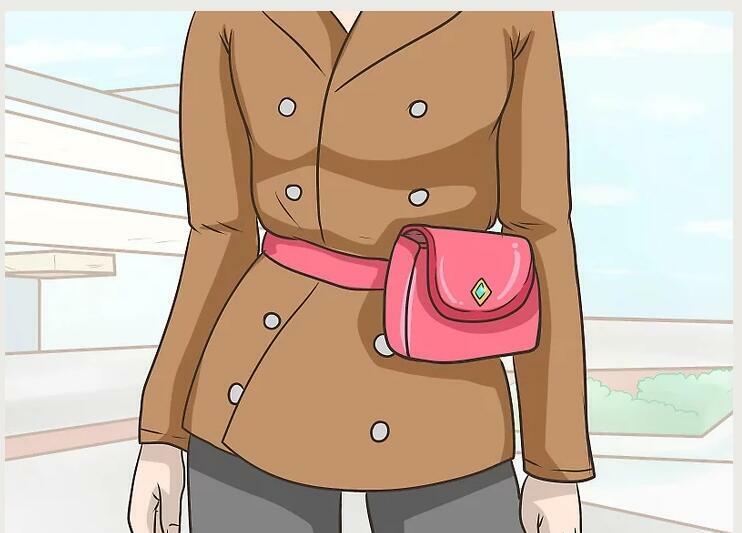 Put a fanny pack over a winter jacket for a sophisticated look. 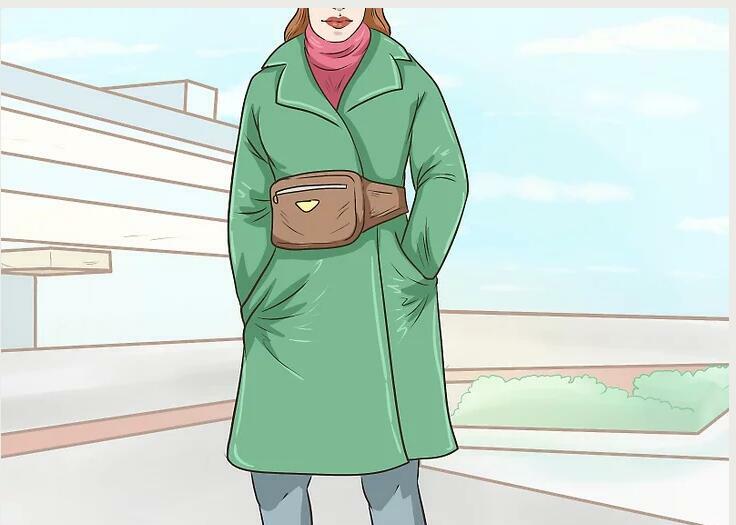 In the winter, wearing it over your clothes may still hide your fanny pack so move it so it's on the outside. Try wearing one over a trench coat, for instance, for easy access. Wrap it around your natural waist or just below to help define your silhouette. Pick one that adds a pop of color or try one that blends in with the outfit. You could also put one over a blazer. 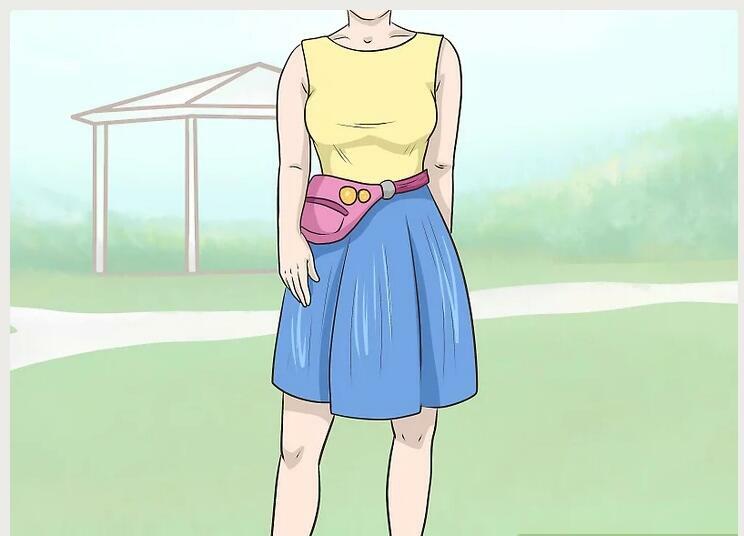 Try a fanny pack on top of a dress.You may not think a fanny pack goes over a dress, but think again. Many fashion-forward celebrities rock this look. Just pick a stylish bag in a quality material, and you're good to go. For instance, try a leather bag over a maxi dress. Other quality materials include silk and wool. This look works best for casual looks, date night, and semi-formal events, depending on the bag you choose. Skip it for formal events. Pick a small bag for a more sophisticated look.Just like a regular handbag gets smaller with a more elegant outfit, so should your fanny pack. Think of a smaller fanny pack as the clutch of the belt purse world. Opt for a diminutive bag that goes with your outfit. A "little black bag" is a good option, as it can go with many outfits. Try one with a slender leather strap or even a delicate chain. Pick a structured bag over a slouchy style. Try an envelope-style fanny pack with clean lines for a suit.This type of fanny pack is no-nonsense. Pick one that has few embellishments and choose a higher end material, like leather or suede. You can get away with wearing this style a little larger, as the simple lines won't overwhelm your outfit. Use a slouchy fanny pack for a fun look.A slouchy fanny pack is more of the traditional, 80s-style bag. It has less structure, and you can wear it loose over your waist. Try a black bag over other fun prints and colors. Alternatively, pick a bright, patterned bag, and wear it over more neutral colors. Go big and bold with a bright fanny pack over bright layers. This look works especially well when it's cold out. Everyone else will be wearing dark and drab colors, and you can stand out! Pick a color, and draw it throughout your outfit, including your fanny pack. Throw a bright jacket over it all for a fun and flirty look. 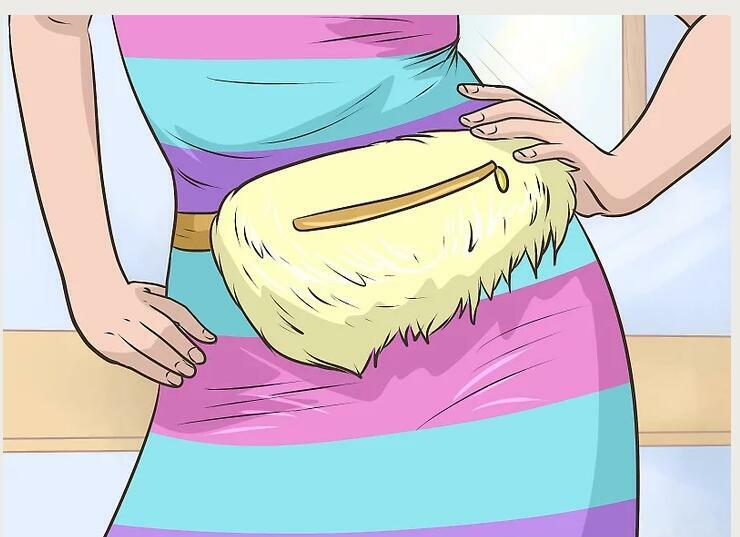 For a truly bold option, try a fanny pack covered in faux fur! Add pins to make your bag your own.Pick fun little enamel pins or even buttons with colorful sayings. You could even add floral brooches. Arrange them on your bag for a fun look that's all yours! You could also sew on interesting coat buttons. Your local fabric store should have an aisle of buttons to choose from. Attach a bow for a girly touch.Clip on a kid's hair bow in a fun color to add a fun and feminine touch. Alternatively,make your own bow=, and sew it into place. You could even make a series of small bows to attach across your bag. For a simple addition, tie a thin ribbon into a small bow. Trim the ends, and burn the ends quickly with a lighter to keep them from unraveling. Sew it into place with a needle and thread or glue it on with fabric glue or a bit of hot glue. Iron or sew on patches to make a statement.Embroidery patches come in a variety of forms, so that makes it easy to find one perfect for your style. You could add little stars, flowers, fun sayings, kittens, or even just your name. Find patches online or at craft stores. Tie on a small scarf for a pop of color.Lay a small square scarf out flat. Roll it up from one corner to make a long band, and then wrap it around a strap for your fanny pack. Make a knot, and you've added a bit of color to help the bag match your outfit!